Logic 2+2 quick transforms from 2 or 4 wheels; with two types of automatic folding systems, through two buttons. Takes up minimum space when folded, fits everywhere. Easy to fold up and to unfold. Capacity: 116-pint. Weight: 6,4-pound. Product dimensions: 41,73-inch by 15,75-inch by 19,99-inch. Max load: 44-pound. Wipe clean. ROLSER looks after you, Maximum comfort and a concern for health have formed part of ROLSER's philosophy from the start, because carrying weight incorrectly is one of the mail causes of back injuries. For this reason, using a ROLSER trolley for your shopping or to carry big loads helps you to look after yourself. ROLSER looks also after the planet, Did you know that plastic bags take 500-year to biodegrade and disappear from the surface of our planet? Every year each of us uses more than 300 of them. You do the maths. 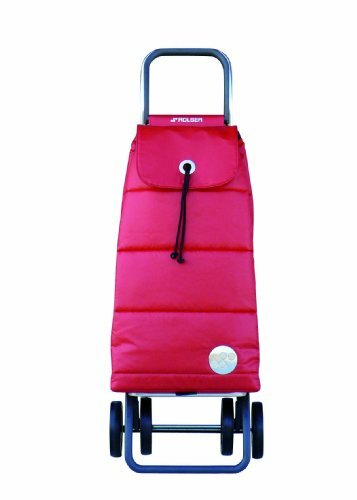 ROLSER thinks that everyone should have their own means of transport to use and reuse a thousand times making a trolley the most responsible way of doing your daily shopping. If you have any questions about this product by ROLSER, contact us by completing and submitting the form below. If you are looking for a specif part number, please include it with your message.